Samsung's newest, 2018 edition of its iconic IconX wireless earbuds are up for grabs at 25% off thanks to Amazon's ongoing Prime Day event. That's not the first time the earbuds are discounted in a similar fashion, but you might have missed the previous deals offered by various US retailers both online and off. In any case, the Samsung Gear IconX (2018) rights most wrongs of its predecessor, chiefly the battery life, retaining all the good stuff like fitness tracking, built-in memory, and good fit. It's all in our Samsung Gear IconX (2018) review if you want to know what you are getting. The set is now retailing for $150, $50 off the MSRP. The last time these earbuds were on sale for such a low price was back in December, so fast forward to the summer activities, and you'll have a nice set of buds to rival Apple's AirPods at this price. Another good thing about this deal is that Amazon is selling the US version of Gear IconX (2018) and that they do come with a warranty. The Gear IconX (2018) earphones sell for less than $200 every now and then, but the price rarely dips 25%, so now is as good a time as any to get the goods. Bose SoundSport Free are much better than those, still garbage in terms of sound, but at least in acceptable category. Hopefully, some brand will release something decent in this category, in the future. BTW Please enlighten me, why BT 5.0 matter on Jabra? I disagree with you that the Bose SoundSport Free are better than "those". I will be comparing them to the Jabra Elite 65T, as that is what i consider the very best you can buy, if you want the best deal for your money, which is what most of us want. The Bose SoundSport Free has a decent sound, but they're massive and have a really clunky design. It's heavy, big and looks horrible, especially compared to something as compact as the Jabra Elite 65T. Furthermore, the case of the Bose is massive compared to the case of the Jabra Elite 65T, and it only ensures 2 charges, which is identical to the Jabra. You might think the Bose can last longer then, but they actually don't last longer than the Jabra either, as evident by reviews and battery life promises from brands. Additionally, the Jabra actually has fast charging tech in their case, while the Bose doesn't, afaik. Here is a comparison of size and look: Bose SoundSport Freehttps://www.power.dk/images/products/17817748025_Bose_7743730020_EN_25.jpg Jabra Elite 65Thttps://www.jabra.dk/-/media/Images/Products/Jabra-Elite-65t/Layout/shakeit/shake_thumb.jpg "Please enlighten me, why BT 5.0 matter on Jabra?" The problem with truly wireless earbuds is connection, and BT 5.0 is the best and newest within BT tech, and it ensures a better connection as it improves the range and stability of the connection significantly. Additionally, it has a lower power consumption. If you look at reviews from identical sites, then the Jabra receives higher grades from essentially every single one i could find. 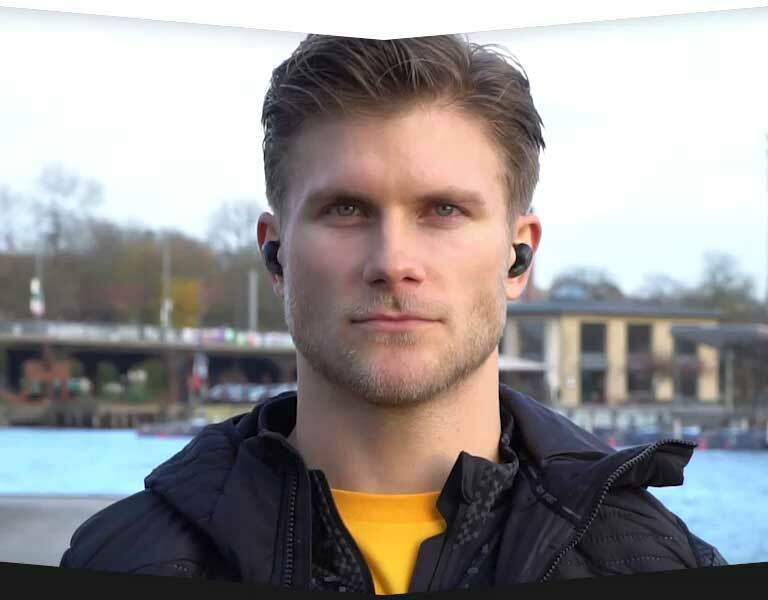 The Jabra generally receives fantastic grades. Mobilsiden.dk: Jabra - 5 out of 6, Bose - 3.5 out of 6 The verge: Jabra - 8 out of 10, Bose - 7 out of 10 Tom's guide: Jabra - 9 out of 10, Bose - 8 out of 10 I could point out more things, but I will end my rant here with a simple and surprising fact. After hearing all of this, you might expect that the Jabra elite 65T to be the more expensive offering, but they're actually cheaper than the Bose. This is actually really sad. 0 mention of sound quality - only formfactor and design. BT 5.0 is really small update for audio related devices - BT codecs matter much more. Plus comparing grades on a mobile phone related web with zero experience in the field of headphone tests. I guess PR talk still works on some people. Sad. I haven't personally owned and compared both of them, so how can i comment on something i don't know? All i can do is show you what actual reviewers say, who has heard them both, and they essentially all rate the Jabra Elite 65T higher, so that gives you all the evidence that you need. Furthermore, BT definitely matters, as that is literally how they connect, and the main problem with essentially every single truly wireless earbud is the stability of the connection. Additionally, BT 5.0 is less power demanding, which is why the Jabra Elite 65T is both smaller and more comfortable, while lasting as long, if not longer than the Bose. I've never said BT codecs doesn't matter, it obviously does, but i wonder if people can even hear the difference between them. The Jabra Elite 65T doesn't have issues with audio delay like so many others, so that's definitely a good indication. "Plus comparing grades on a mobile phone related web with zero experience in the field of headphone tests." Oh, you do know the reviewers on a personal level? Do you know if they have any experience in the field or not? They are the headphone/earphone reviewer for those sites, so they probably have a lot more experience than the average user, which means their opinion is much more qualified than the average user, which is actually the ones buying them. "I guess PR talk still works on some people. " This has nothing to do with PR.